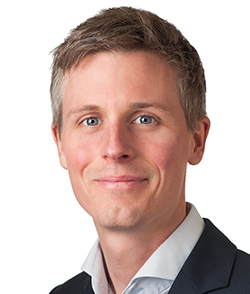 Thorsten Kahnt, PhD, assistant professor of Neurology, is the corresponding author of a new study examining the neural circuitry and mechanisms of generalization. The brain constantly uses previous experiences to interpret new ones. Applying prior knowledge of a sight, sound, smell, taste or touch to infer information about a different but related stimulus is called generalization. Too much or too little generalization, however, can contribute to psychiatric conditions such as post-traumatic stress disorder, schizophrenia and depression. In a new Northwestern Medicine study published in eLife, scientists explored how the neurotransmitter dopamine regulates stimulus generalization and showed that modifying dopaminergic activity could lead to future treatments for psychiatric disorders. The investigators discovered that the degree to which humans generalize depends on dopamine D2-receptors (proteins that detect dopamine) in the hippocampus, a region of the brain involved in learning and memory. The study demonstrated that blocking D2-receptors reduces generalization between stimuli. For example, research shows that people with post-traumatic stress disorder overgeneralize. A wide variety of stimuli – ones that minimally resemble features of the traumatic event previously experienced – can trigger the old memory and elicit stress or anxiety. In the study, healthy volunteers viewed visual stimuli while lying inside a functional magnetic resonance imaging (fMRI) scanner. They learned to associate a set of lines oriented in one direction with a reward and a set of lines oriented in another direction with no reward. The next day, one group of volunteers received a drug that blocked D2-receptors and a second group received a placebo. Then they all viewed new images of lines with different but similar orientations from the first day and selected which ones they thought would be rewarded and which ones would not. The blocked D2-receptor group predicted that a narrower range of stimuli would be rewarded than the placebo group. The study is the first to show that dopamine has a direct role in generalization in humans. While blocking the D2-receptor pharmacologically reduced generalization in this study, Kahnt notes that it may not be the most efficient way to manipulate generalization. He is now investigating new ways to do so, such as non-invasive brain stimulation techniques. This study was supported by grants from the Swiss National Science Foundation.